Frankfort, KY—Tuesday at midnight saw the end of the 2014 legislative session of the Kentucky General Assembly. Representative Larry Clark (D-Louisville) was instrumental as a member of House leadership in helping to shepherd legislation through the process as the session came to an end. A compromise was reached between the House and Senate and a two-year highway and roads spending plan was passed on the final day. “The process of passing budgets and legislation is always difficult but we got the job done and there will be no need for a special session,” says Representative Larry Clark. Key pieces of legislation were sponsored and passed by Larry Clark on the final day. Legislation to increase accountability and transparency for economic development incentive programs in Kentucky, House Bill 17, passed and is headed for the Governor’s signature. Last year Clark filed similar legislation (HB 242) that passed 100-0 in the House of Representatives. Clark says the legislation was recommended in a study of Kentucky’s economic incentive program that was performed in 2012 following the passage of a joint resolution Clark sponsored in 2011. Also included on the final day was the passage of two important transportation bills. House Bill 237, the two year state highway plan and House Bill 236 which includes $3.5 million in each year of the biennium for non-public school transportation. This provides bus services to children who attend private schools in Jefferson County. 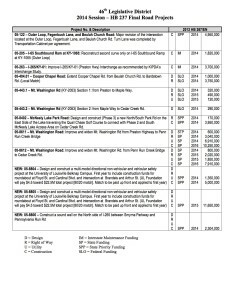 Representative Clark secured funding for critical highway and road projects in the 46th Legislative District that can be seen in the attached list. Click here to view the list of road projects. Larry Clark represents the 46th District in Louisville and has served in that position since 1984 and he maintains a 100% voting record. He has served as House Speaker Pro Tem since 1993. Clark has sponsored legislation for job creation, economic development and education, and he has been a supporter of seniors and veterans. For more information, visit www.KeepLarryClark.com.